Trevor Rose (’04) has experienced both sides of the adoption process as an adopted child and now an adoptive parent. “Looking back on the process from start to finish, we see God’s hand sculpting this work. The timing was too perfect to be anything other than God’s timing,” he says. Enjoy his story as we continue our series about Abilene Christian University alumni who have followed their hearts to adopt. Trevor is the first assistant county attorney in Cherokee County, Texas, and his wife, Courtney, is a pediatrician in Tyler. My adoption story begins long before I was born. The couple I call Mom and Dad had trouble conceiving a long time before I was born. They adopted a girl in 1976 and decided to adopt again a few years later. Time passed while they waited for a little boy, and in 1981, I was born. They adopted me from Christian Homes for Children (now Christian Homes and Family Services) based in Abilene. They provided a wonderful home for me growing up. Fast forward a few years. I graduated from ACU in Spring 2004. A few months later, a friend from ACU set me up with a blind date. My wife, Courtney, and I have been together ever since. At the time, she was in medical school and I was applying to law school. We were married in September 2007 just in time for her to graduate and move to Houston for residency, leaving me behind to complete my law degree a year later. A few years into residency, we began trying to conceive a child, with no luck. A struggling young attorney and an underpaid resident could ill afford many fertility treatments, but we tried anyway. After one round of intrauterine inception, Courtney’s physician gave us the news that it would be extremely unlikely she would conceive with fertility treatments, much less naturally. Because of my background, we had always planned to adopt at some point. In our hearts, we knew God had a plan for us. After a few years of continuing to try to naturally conceive (still no luck there), Courtney completed her residency program, and we moved to Tyler. We found a church, met tons of amazing people, and were eventually invited to a fundraising dinner for Christian Homes. There, we connected with some of the amazing people who work at Christian Homes, many of whom know my parents from when they adopted me. It was at that dinner that we began the process of adoption. We chose Christian Homes to help us with our adoption. We attended orientations, waited, filled out forms, waited and waited some more. After re-evaluating some selections we had made on one of the many forms we filled out, we discovered a few mistakes. After 14 months of waiting, we corrected those errors, and within two months received “the” phone call. We traveled to meet the birth mother and fell in love with her family. We were at the hospital for our baby’s birth. Henry is now 7-1/2 months old. 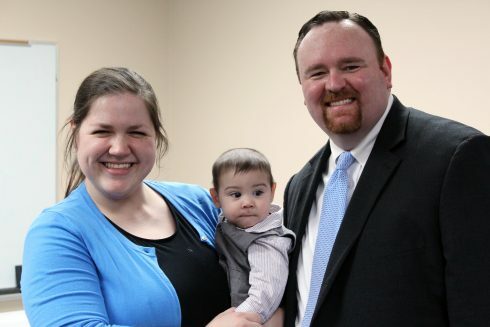 We consummated his adoption Feb. 19 at the Taylor County Courthouse in Abilene. 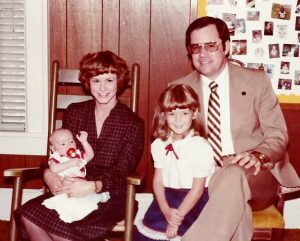 In so doing, I was one of the first Christian Homes adoptees to subsequently adopt from Christian Homes. Looking back on the process from start to finish, we see God’s hand sculpting this work. The timing was too perfect to be anything other than His. There were many difficult nights when we wondered if we would ever receive a call, but looking back, we can see that God wanted to bless our lives with this birth family and this particular child. I only hope and pray that God will guide us in raising Henry and help us to be a Christ-like example to him amidst the constant bombardment of this world.